Do you got a Harry Potter fan in your household? Do they wish they had a wand of their own to practice spells? Then I have the perfect toy for you. Disclosure: We received some wands in exchange for this post. This post contains affiliate links. You can buy wands of Harry Potter, Albus Dumbledore or Voldemort but these aren’t just any wands! They come with a paper that shows you how to cast 11 different spells and the wand can tell if you did the spell right or not. What spells can you do? You can do the following 11 spells: locomotor, alohomora, incendio, tarantallegra, finite incantatem, arrestor momentum, wingardium leviosa, and mimblewimble. Each spell is cast differently by making a different movement with your hand. The included guide shows you how. The wand provides feedback in the form of sounds so you can tell if you did it right or if you need more practice. The wands have five modes of play: two modes of standalone play and three modes of play with a friend. Uses 3 AAA batteries (included) and recommended for ages 8-11 although younger kids could still play with it in their own way and older kids would probably get a kick out of it too. Winner of 2018 National Parenting Product Awards and 2018 Toy Insider Hot 20. 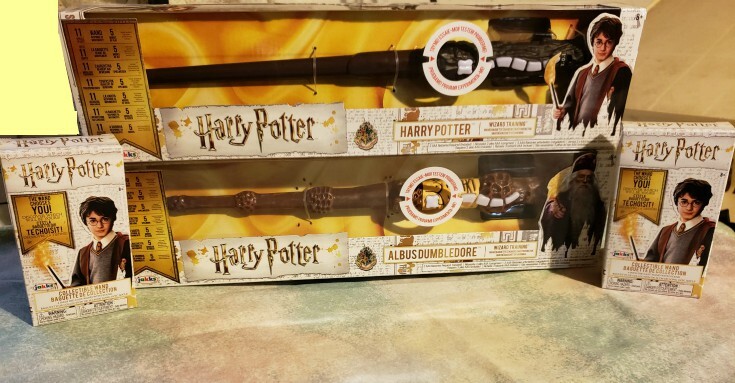 For older kids or anyone who prefers to collect wands from different HP characters and doesn’t need them to light up and make sounds, there is also the die cast collector’s wands which come in blind packs so it’s a surprise which one you’ve got. There are 12 to collect: Harry Potter, Minerva McGonagall, Bellatrix LeStrange, Severus Snape, Newt Scamander, Ron Weasley, Hermione Granger, Albus Dumbledore, Porpentina Goldstein, Luna Lovegood, Lord Voldemort and Draco Malfoy. Each wand is 4 inches long and comes with a stand. You can find the wizard training wands on Amazon (below) or at Chapters/Indigo, Toys R Us, Walmart or Target. 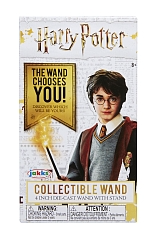 The die cast collectible wands are also at Amazon and the stores mentioned.